Check out my article on macadamia nuts which featured in the Autumn edition of Sprout Magazine. Originally referred to as the ‘Kindal Kindal’ tree by Australian Aborigines, the macadamia tree evolved over 60 million years ago to become Australia’s only native commercial food crop and the only Australian native food to be widely traded internationally. There are at least ten species of Macadamia, but only two of those produce edible nuts—the Tetraphylla and the Integrifolia. An evergreen tree with shiny dark foliage, macadamia trees grow to heights of 12 to 15 metres and can take up to 15 years to mature. Preferring a subtropical climate, the majority of Australia’s macadamia crop is centred in northern New South Wales—which produces around 60 percent of Australia’s crop—and south-east Queensland, where rich soil and high annual rainfall provide the perfect conditions. The season starts around April each year and runs until late September, early October. With over 70 per cent of the annual macadamia crop exported, the Australian macadamia industry is reported to be valued at over $200 million a year. Although macadamias were first commercialised in Hawaii, Australia is a leader in the production, research, marketing and development of macadamias and, according to the Australian Nut Industry council, Australia holds the only natural germplasm—or genetic material—resources for macadamias. Considered more of an indulgent treat rather than an everyday food due to their high price, macadamia nuts have a delicious buttery flavour that combines well with tropical fruits, such as coconut, mango and papaya. 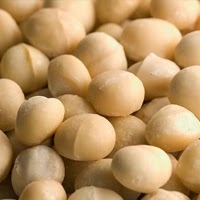 Chopped macadamia nuts also make an excellent addition to many savoury dishes and are popular with chefs and foodies. Macadamia grower Penny Buckland of Valla Nuts in Northern New South Wales says that macadamia nuts are expensive to grow and this is often reflected in store prices. ‘Farmingmacadamia nuts is expensive, requires a lot of equipment and is very labour intensive, from the orchard set up to mass plantings, spraying and harvesting.’Nut prices are set at the beginning of each season by theprocessing companies and depend on a variety of factors that include nut quality, pest damage and moisture content. Farmers get about 10 per cent of the cost of the final product,says Buckland. Macadamia nuts are an excellent source of manganese and thiamine, as well as a good source of magnesium, phosphorus, fibre, selenium and copper. And their oil, once considered a by-product, has very high levels of oleic acid which has shown to reduce inflammation, lower bad cholesterol, reduce the symptoms of asthma, boost memory and increases the absorption rate of nutrients and fat soluble vitamins. Pamela Brook of Brookfarm Macadamias near Byron Bay in New South Wales has helped pioneer the use of macadamia oil in Australia. ‘When we started it was seen as a by-product but we decided to use only the finest quality nuts for pressing.You get great olive oil from using the best olives, the same with macadamia oil,’ she says. Two of the biggest issues facing macadamia growers are nut prices and the weather. ‘The last few years have been tough with large volumes of rain that affected production,’ says Penny Buckland. 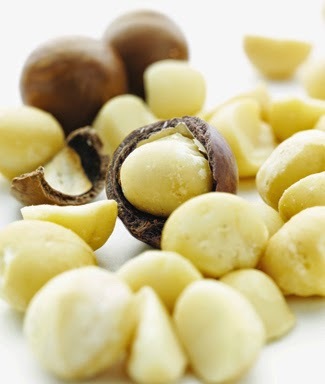 Valla Nuts currently has 1,660 macadamia trees that are harvested and de-husked on site. The nuts are then transported by truck to a macadamia processing centre co-op near Lismore where they are usually processed within 24 hours. The majority of Valla Nuts are exported says Buckland—and their consistent quality means they are sold at premium prices. The clean and green reputation of Australia’s nut industry has been challenged in recent years with industry losses in the tens of millions as a result of La Nina weather patterns according to the Australian Nut Industry Association. 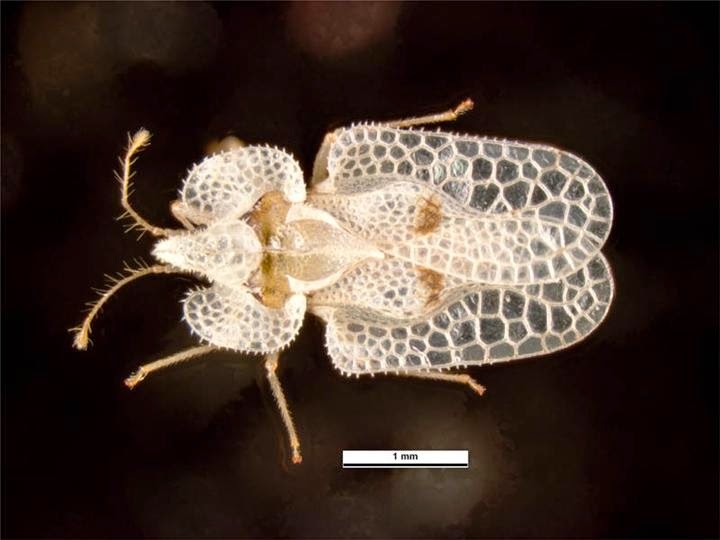 In addition, growers say there two major pests affect macadamia trees: the lace bug and the fruit spotting bug, which have resulted in the use of pesticides. Greg Bennett, who runs a certified organic macadamia farm near Nimbin in New South Wales, says that in the last year his yield has been ‘hammered’ by pests, resulting in a 90 per cent loss.Whilst Bennett sites personal choice and lifestyle as a reason for not choosing to use pesticides on his farm he says he understands why the majority of macadamia farmers use them. ‘I chose to farm organically because I live in the middle of my orchard and I don’t want pesticides in my drinking water. But I’m not anti conventional, I understand why farmers use sprays—for commercial crops there are no other options available’. Currently, there are eight registered chemicals permitted for use in macadamia farming in Australia. An insecticide named Chlorpyrifos is one such chemical. In 2010 the National Toxics Network (NTN) and WWF Australia listed Chlorpyrifos as one of Australia’s most dangerous pesticides. According to NTN, an interim report published by the APVMA in 2000, indicated that the insecticide Chlorpyrifos had been under review by the industry regulator, the Australian Pesticides and Veterinary Medicines Authority (APVMA) since 1996 because of its toxicity to humans, acute toxicity to birds, water pollution and other factors. At present, Chlorpyrifos is permitted for minor use by the APVMA for the control of Australian plague locust in tree nut orchards. The permit remains in force until 2017.
increase air and light around the crop due to an increase in insect pressure’, says Buckland. Similarly, Bennett has also reduced his crop by 25 per cent to help reduce the impact of lace bug. Both Buckland and Bennett agree that more research and development is needed by the industry to develop biological control solutions to pest management. ‘More biological control would help make the market more appealing to new growers. It would also help reduce the cost of pest management for farmers,’ says Buckland. For the base, cream the butter and sugar until fluffy. Add the egg yolk and mix well. Sift flours, salt and custard powder then add to the butter mixture. Mix to a firm dough. Press into a greased 18cm x 28cm lamington tin. Bake in moderate oven (180–190C) for 15 minutes or until golden brown and remove from the oven. For the topping, place sugar, golden syrup and butter into a saucepan and stir over a low heat until the sugar has completely dissolved—do not burn. Simmer for 5 minutes without stirring or burning. Stir in the chopped macadamias. 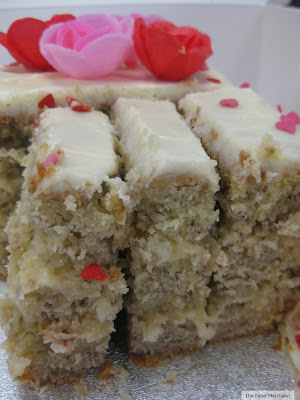 Quickly spread onto the biscuit base. Photos vary slightly from original article. Great article Erin! I always get a bag or two of Hand ‘N’ Hoe's from the market, love them!